Evidence of avalanche slides, near Baker Creek, April 10, 2019. Over the last few days, an unstable mix of rain and snow in Central Idaho has led to several avalanches. One of them destroyed two homes. Avalanche danger remained high into Wednesday morning, in an area stretching from the Sawtooth Mountains north of Stanley, south toward Fairfield and down the Wood River Valley into Bellevue. By Wednesday afternoon, the avalanche threat at higher elevations was downgraded from the highest level to "considerable." 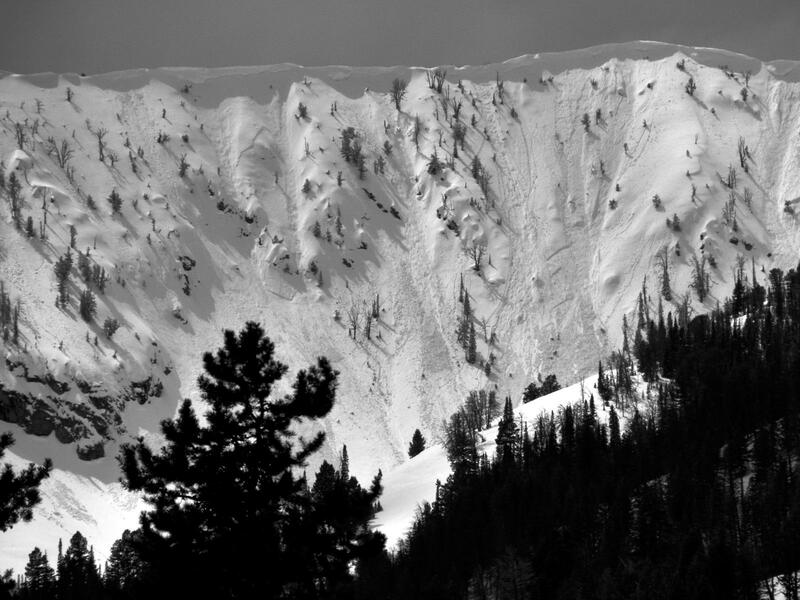 Several so-called “wet avalanches” were detected earlier this week. These occur on steep slopes after heavy precipitation and warming temperatures, creating an unstable mixture of snow and rain. On Monday, an avalanche came down through the Warm Springs creek drainage, just west of Ketchum. Avalanche specialist Ethan Davis produced a video of the aftermath for the Sawtooth Avalanche Center. "As you can see, initiated in wet snow, above me here," he said ,"a giant slab came roaring down this drainage and piled dozens and dozens of trees here." Davis reported in front of one of the two homes destroyed by it. "One can be seen behind me here. You can see that the house has been moved from its foundation at least 10 to 15 feet off to the side. The pile of debris behind me is upwards of 40-feet deep and contains dozens of trees." There were other avalanches: in the Smoky Mountains, both north of Baker Creek and in the Beaver Creek drainage. What’s Left To Clear Of Idaho's Highway 21 Avalanches? If you live in Stanley, Idaho, it’s going to take you an extra couple of hours to drive to the Treasure Valley. That’s because an 11-mile stretch of road between Lowman and Stanley is still covered in snow. Winter and early spring in the West means it's avalanche season. Several avalanche warnings have recently been in effect for parts of south central Idaho. And at least 17 people have died this season, including a Bellevue, Idaho man.